Output: HDMI femal, DVI femal, VGA female. 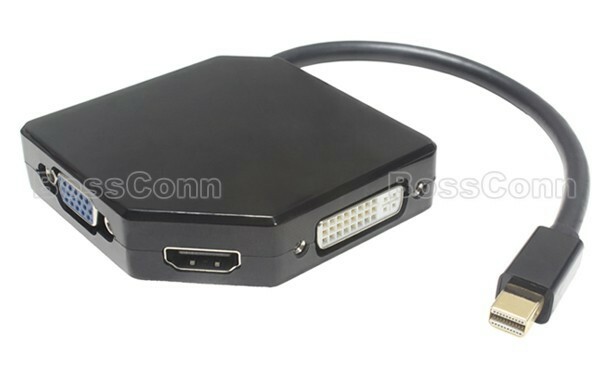 Full HDMI or DVI interface support from the TMDS output. Compliant to VESA DisplayPort Standard version 1.1a for both 1.62 and 2.7 Gbps link rates. Compliant to HDMI 1.3a specification up to 2.25 Gbps. Supports multiple color format: RGB 6/8/10/12-bit per component (bpc) and YCbCr4:4:4, YCbCr4:2:2 8/10/12bpc. Supports up to WUXGA 1920*1200@60Hz reduced blanking and 8-bits/color (using standard VESAGTF timing). Triple 8-bit, 170MHz video DACs for 24-bit VGA mode. One port displays at one time. Extended features include automatic power down and automatic port switching. Single 3.3 V power supply. 0° to 85 °C operating temperature range. ESD: Human Body Mode to 8 kV. Notebook Docking Stations, PC Desktop and Notebook Motherboards.